Spring was here at last! 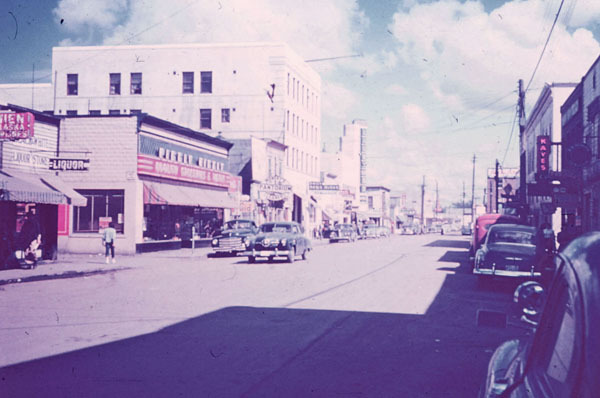 The spring of 1952. For our little family, it followed a hard fall and winter, especially for my wife. She had faced the usual problems and restrictions of pregnancy, combined with an emergency appendectomy early on and, for several weeks afterward, disabling pain caused by a nerve pinched during labor. Now these issues were receding and we were enjoying the spring in all its glory and abundant life, made more abundant by the recent birth of our first child, a boy. We looked forward to a busy summer, introducing the newborn to a large extended family. Then one day the boss asked me to accept a field assignment in Alaska, running from June 1 to mid-September. Except in the most serious of family crises, I would never reject an assignment for personal convenience. But I always examined an assignment closely, not wanting to waste time and effort on some ill-conceived “boondoggle,” as we called such things. Put to that test, this assignment came up short. 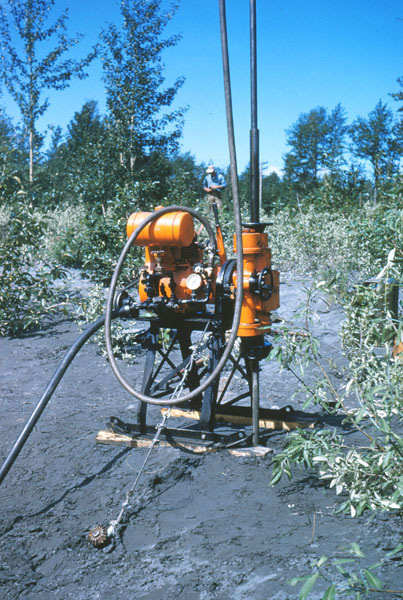 Our Alaska Terrain and Permafrost Section, it seemed, had bought a small drilling rig, powered by a gasoline engine. It could be carried by two men. I was being asked to test it in the field and to prepare a report for a couple of government agencies, recommending for or against the purchase of more rigs. It had a small diamond coring bit, shaped sort of like a doughnut, designed to extract core samples from hard rock for prospectors seeking mineral deposits. However, our rig was bought to study permafrost, a layer of permanentlly frozen ground that underlies much of Alaska, extending from a few feet beneath the surface to great depths. 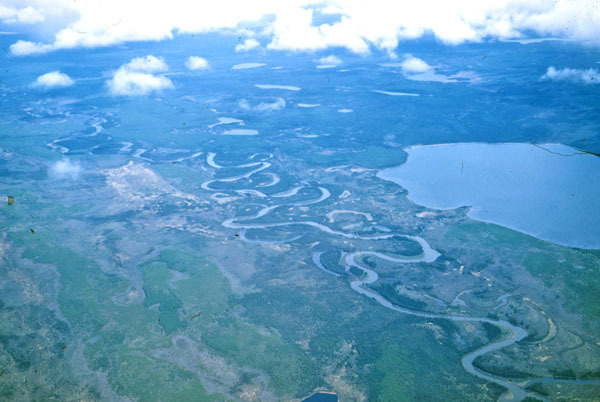 The area of interest was in sands, gravels, and clays deposited by past glaciers in lowlands and valleys. We wanted core samples of the frozen sediments, and we wanted to explore for ground water resources that might be held within the permafrost. Yes, the drill was designed for hard rock, but isn’t frozen sediment the same type of thing? Hardly. Drilling quickly melts the frozen material into some kind of muck. The churning of this slop would surely prevent recovery of any decent kind of core sample. And, when drilling stops, the muck refreezes quickly and can permanently trap the drill. 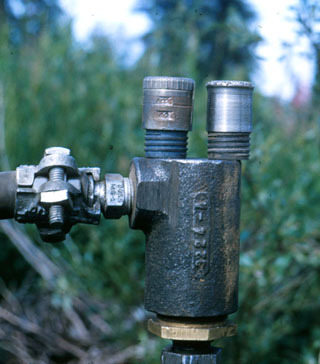 How can such a small drill-hole (about 1.5 inches diameter) be used to detect ground water? My colleague Paul Johnson, an experienced ground-water geologist, said it best, “Well, you could put a soda straw in it.” And thus was born the name of the project. From thoughts like these, I decided that the assignment was simply preposterous. But that wasn’t something to tell the boss. The drill had been bought and so, in simple government logic, it would have to be tested. When I rejected the assignment, I cited other factors. Without experience in either drilling or gasoline engine operation, I would be solely responsible for keeping this piece of machinery in running order. Visiting various field parties, I would have to ask them to help me with all the tasks of brawn that drilling involves – an unlikely hope, inasmuch as they were all deeply absorbed in their own work. And what if I found the drill useless within a couple of weeks? What would I do through the rest of the summer? After mulling my objections for three or four days, the boss presented me with an offer I couldn’t refuse: I would be supported by a geologic field assistant experienced in engines and in drilling. Also by an experienced ground-water geologist – none other than Paul Johnson of soda-straw fame! And finally, the three of us could conduct ground-water research studies, with or without the drill, for the rest of the summer. And so I made my way to Alaska on the first of June. Air travel in the early 1950’s was distinctly a different experience from today’s version. Crowded airports were a rarity, and the travelers were shown the courtesies – and the luxuries, particularly in food – that are now reserved for Very Important Persons. Even the atmosphere added to the quality of the experience, much of the time permitting clear views of the beautiful lands beneath. Banks of haze and smog, so widespread nowadays, were seldom encountered. I did my best to get seats by the windows, and my camera was always ready to click. I made a brief visit in North Bay, Ontario at the Longyear factory where our little rig, known as the Porta-Drill, had been produced. Afterward, on the final flight from Edmonton, Alberta, we spanned three time zones and ended early the next morning in Anchorage. Paul Johnson was waiting at the Anchorage Hotel, an overcrowded place in which he had been lucky enough to find a room. An annex to the hotel, renovated and still standing today, had been opened in 1936. But he was in the original rickety frame structure, built in 1916 and headed toward demolition in the 1960s. As Paul opened his door for me, I was nearly overwhelmed by a dense cloud of alcoholic fragrance. In the midst of the cloud he stood, his face a brilliant red, showing clear signs of fatigue. Beyond him, I could see a fellow I didn’t know, passed out on a bed. “Good Lord,” I wondered, “what am I getting into?” I saw only one positive sign: Paul was smiling from ear to ear. He seemed very glad to see me. Slowly, the story emerged. Yes, Paul was tired after a series of flights from Washington, arriving just a few hours earlier and well past midnight. Before boarding that last flight, he committed an error common to inexperienced air travelers. He opened a bottle of whiskey for one shot, then replaced the cork and put it in his suitcase. That bottle found new life in the rarefied upper atmosphere. Now he had all his clothing from the suitcase hung out to dry. Hence the fragrance. As for the other fellow, Paul didn’t know him. The hotel was pairing strangers off in the same rooms. This fellow was on a night shift and had arrived just a bit earlier for his daily snooze. Paul’s red face, I finally recalled, was a permanent fixture. And so, all irregularities were accounted for. 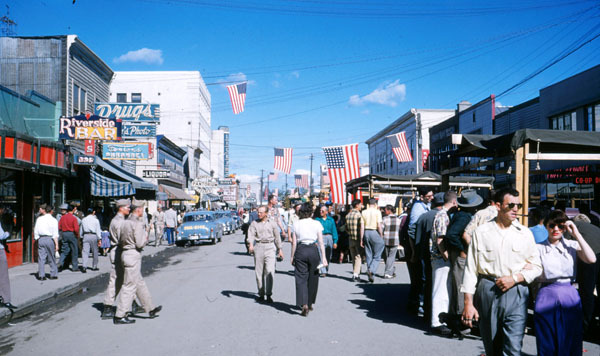 Mid-century Anchorage was coming out of its earlier stage as a rough-and-ready frontier town. Perhaps I was naïve, or had read too much tourist literature, but I was surprised to see such modern urban touches as parking meters and traffic lights. 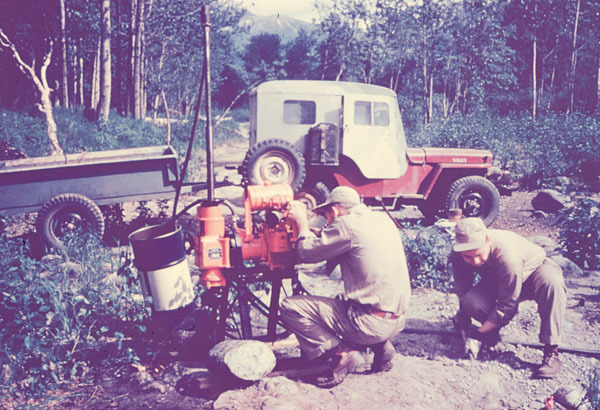 Most of the camping gear and field equipment that we would need – including the Porta-drill – were in a storage shed in Palmer, a town 40 miles northeast of Anchorage. It served Alaska’s small but principal farming district, noted for its greatly oversized vegetables, the apparent result of endless daylight through a short growing season. 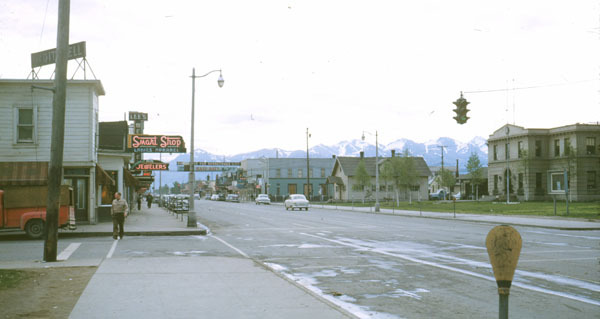 The downtown area of Palmer extended a couple of blocks; the town’s one hotel, the Matanuska, stood nearby. All told, my field assistant and I spent 3 or 4 weeks of that summer in Palmer awaiting word from our bosses as to what we should do next. The ground water research that had first been offered had never panned out. The food was excellent, but the principal entertainment consisted of two pieces of music on the jukebox: Blue Tango and Jealousy. Tangos were in style that year. One critical item, a jeep, had been shipped to Fairbanks the previous fall for a major engine overhaul. So we took an railroad trip of about 350 miles to pick it up. 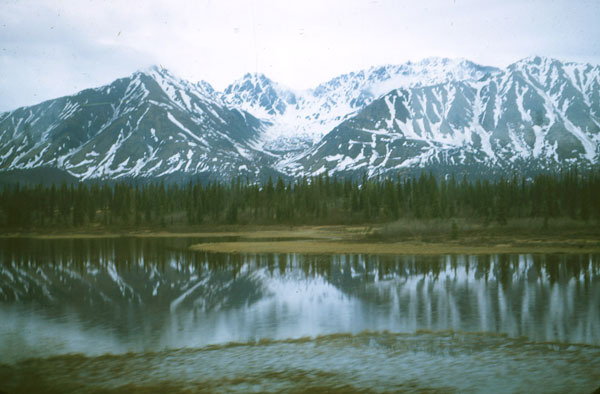 As the train passed through the Alaska mountain range, fog and clouds prevented any view of the famous Mt. McKinley, North America’s highest peak, at 20,320 feet. But we did see other lesser mountains that were spectacular enough for me, given that I had never before traveled beyond the eastern United States. Then we drove the 500-mile trip back to Palmer, via Tok Junction near Alaska’s eastern border. We could have saved 100 miles by using the Richardson Highway, but parts of it were under construction and closed. Much of this trip was over other roads, also under construction and rough, but open, where speeds above 25 mph routinely bumped our heads against the ceiling of the cab. And so this trip required 5 days. During the drive, we came to know and appreciate the lodges spaced at wide intervals along the highways. They were rustic, usually built of logs, and they featured bars, dining rooms and rooms for overnight guests. 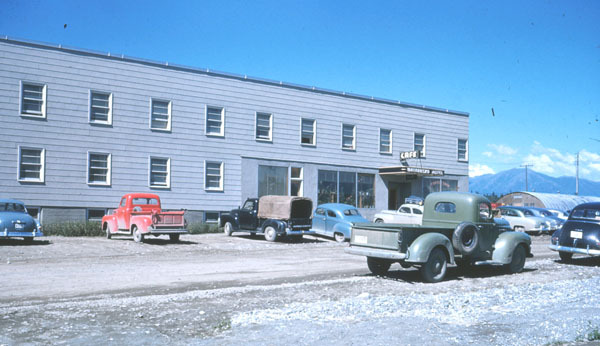 Paxson Lodge was strategically located at the junction of Richardson Highway with the road heading into the future Denali National Park, known at that time to us “palefaces” only as Mt. McKinley National Park. The road map showed these lodges as small towns, but in reality there were few structures other than the lodge itself, a gas station, and perhaps one or two small shops for basics such as alcohol, tobacco, and groceries. I eventually spent a week at Paxson Lodge, but I failed to appreciate it as I should have, because it lacked any postal service, and my wife and I were accustomed to daily exchanges of letters. During the long drive, it became apparent that Alaska was enjoying spring in June. 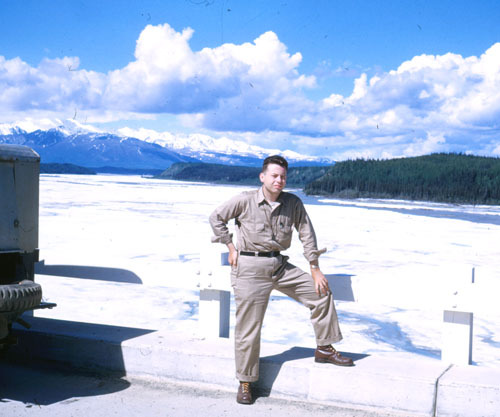 Some of the major rivers were still covered with ice and snow, as seen in this view (featuring the author as a young man) of the Robertson River from the Alaska Highway. Arriving back in Palmer, at last we were ready to test the drill! We set up first just outside Palmer, and gradually moved northeastward along the Glenn Highway. Most of the sediments here were sands and gravels, which made one of our dire predictions come true: Drilling melted the permafrost, the coarse abrasive grains collapsed against the drill bit, and a diamond bit was reduced to a useless nub after a few feet of drilling. 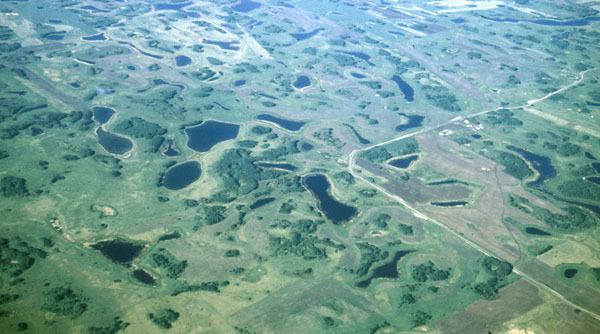 The local geologists and soils scientists urged us to return to Fairbanks, where an agricultural research station contained a broad basin of muck showing the classic signs of permafrost: polygonal patterns in the surface soils. This fine material would not cut so quickly into the bit. And there we staged the season’s final performance. As we passed the depth of 30 feet, progress slowed; we were reaching the maximum weight of drill pipe that we could raise and lower by hand, without a hoist of any kind. Then a further dire prediction came true. During one of the delays, the thin layer of melted muck quickly refroze, and our entire tool assembly was trapped. The situation was rescued with a wrecker of the Alaska Highway Commission. Using its entire lifting capacity until the front wheels rose off the ground, the wrecker managed to jerk the drill assembly loose and retrieve it. There was one consolation for all this trouble. We were in Fairbanks just in time to enjoy the Fourth of July celebrations. We were in no mood to continue the tests. I had speculated that we might find the drill rig useless in a couple of weeks. Actually, we needed only ten days. The only test not completed: We never found a soda straw adequate for detecting ground water, particularly since the drill holes always collapsed promptly upon removal of the bit. Now it was time to write the report. With tongue in cheek, made evident through complete truthfulness, excruciating detail, and ample illustrations, I described and quantified the rig’s performance. I showed “before and after” shots of the diamond bits put to short periods of use. In the final evaluation, I was careful to note that the rig was designed for coring in hard rock, not for the uses we put it to. That was only fair to the rig and its maker. 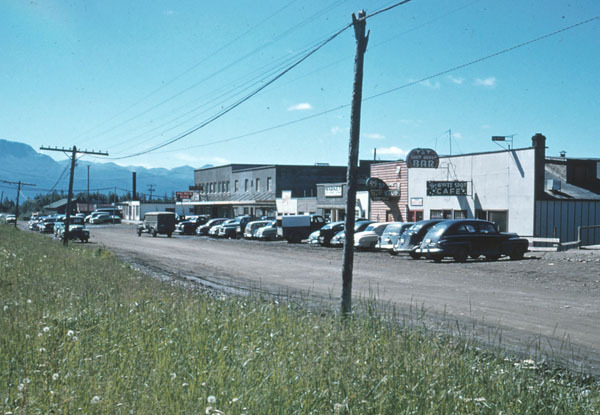 (Fairbanks, Northway, Palmer), J. R. Burns, 1952, 17 p.
This entry was posted in Travel Adventures and tagged Alaska, Alaska 1950s, Anchorage, Fairbanks, Palmer, Permafrost, U.S. Geological Survey. Bookmark the permalink. Our federal government at its best! Un grosso grazie a chi cura il folrum veramente interessante per permettermi di contribuire.